Though price does play a role in her purchase decision, it's not as important as quality or great taste. She is willing to consistently spend more for a food brand she feels is high quality and tastes good. Nutritional value is also very important to women, and 7 in 10 regularly buy food brands that deliver good nutrition. When asked what was important to women when choosing a food brand, quality, taste and price are important, but taste, nutritional value, and ingredients move up in importance. 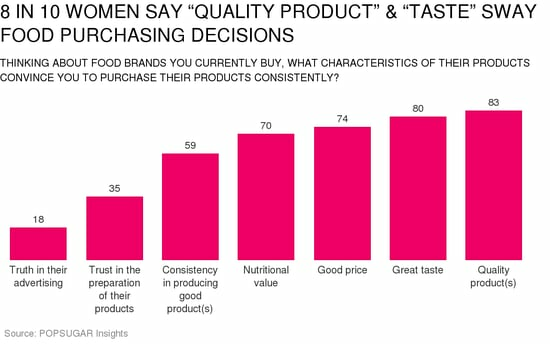 This shows that women have great intentions when choosing a brand, but the brands that they stick with are going to be the ones that offer them good quality and taste at a good price. Food brand attributes that do not play such an important role in women's lives are the actual brand name or if they have a coupon. Women today are savvy shoppers and are looking beyond traditional marketing. They are reading labels, comparing ingredients and nutritional value, and seeking out brands that meet their high standards.